Learning Galilean Aramaic conversationally. Material covered includes introductions, greetings, partings, common sources of discussion, and topical vocabulary. 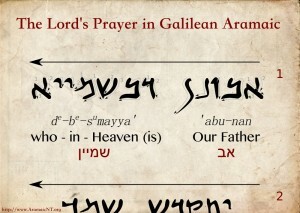 An 8-week exploration of the Lord’s Prayer in it’s original context, working from the Greek New Testament, Syriac traditions, and Galilean Aramaic reconstructions. Additional topics covered include investigating the “odd” translations that have cropped up in recent years. We will be adding to this list over the next few semesters.